I didn’t have a lot of options activity in February. I sold two new puts, in PM and MAT. The PM put was actually the larget premium I’ve ever gotten, 9.00 or $900 for 1 put. I also had a KO put assigned so I was able to pick up another 100 shares. I was happy to pick up more KO at a price below my basis and below market value. My total profit for the year is $118.00. I earned $510.20 in dividends for the month. This is an increase of 102% from last February. My total year-to-date dividend income is $760.14. I’ve updated my dividend income on my Dividends tab. My expected forward 12-month dividend income has increased to $9690.68 from $9330.19, an 3.9% increase since last month. 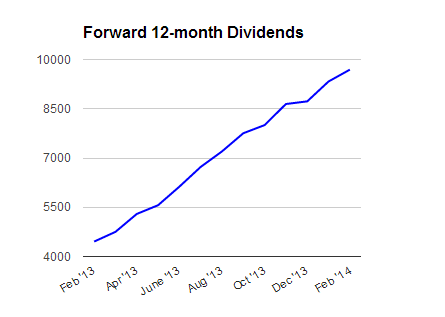 You can find my all of my monthly dividend information from the Dividends page. The following 6 companies in my portfolio increased their dividends this month. Most of these increases were mentioned and can be found on my Dividend Increases label. I’m still marching towards all of my goals. I plan to close on a Rental # 3 in March so that should complete one of my goals. All of my goals can be found on the Goals tab. I mentioned closing on a commercial property for my business at the end of 2013. The permitting for construction is taking longer than expected. I’ll make sure to create a post about this purchase, it’s long overdue I know! I have an offer accepted on a third rental property that I’m hoping to close on at the end of March. If you read my post about this I calculated a ROI of 8% after all costs involved. I’ll be sure and post an update once I know the exact costs and see what I get for rent. I posted my electric bill for a full month on solar. I also received some clarification on reading my bill that I’ll post on the next update. It looks like I’ll pay next to nothing for electricity over the next few months at this rate. I’m still happy about the purchase of the panels. I’m now at $608k, up from $599k. There would have been a much larger increase but due to a larger anticipated tax payment in April, those costs brought it down. I’ve also put down some earnest money on a new rental that isn’t counted yet but should be by the end of next month. My expected dividends for March are $1446. Yes, March is one of my best dividend paying months. These dividends will come in handy and go towards a down payment on my newest rental. My new purchases are going to be significantly smaller over the next two month until my rental is closed and tax time is over. I’m hoping to catch up the second half of the year. I’m getting close to $10k in forward annual dividend income that I should hit in the next couple of months. Congrats on your month. It looks like March will be spectacular as well. I’m getting close to 10k dividends and interest in my taxable account also. After tax season I will be going full throttle with my Sharebuilder account. That’s awesome, you may beat me to 10k since my purchases are going to be lower. I’m with you on tax season. Between that and buying a rental, my cash reserves will be completely gone. Starting in May, I play to kick my purchases into high gear also. it is interesting to see every month, what has been done in others life! In February, my sales were very low at work – I was lazy! But such a contribution motivates me again to work hard to earn lots of money. Because this money can be invested in new stocks! I’m glad you like to stop by and see what I’ve been up to. I was in sales for a while and know how the ups and downs work with commissions. Hopefully, you’ll have a better spring. I’m happy to be able to motivate other to invest. Looks like a great month AAI! I think you made some great purchases this month. I think DE looks especially good right now and hopefully they’ll raise their dividend this year. I noticed they’ve paid 5 straight quarters of the same rate. Looks like a great month for dividend increases. I’m prepping an article featuring 30 dividend increases this past February. I guess many companies with 12/31 Fiscal Year Ends decide to raise their dividends 1st quarter each year. Thanks! I’m holding onto DE even though their projected earnings are in decline. This happens with cyclical companies. I’ll be keeping an eye on them though but I think there is some value at current prices. I’ll check out your article. I also noticed many of my stocks announce raises in Feb. I’m now tracking the month they are announced on my dividend page. Another fantastic month. You’re almost at $10k in forward dividends. That’s awesome, man. Your progress is crazy. I can only wish I could invest $11k for just one month this year, let alone almost every month. Keep it up. You’re going to be FI before you know it. Thanks! I have made leaps and bounds in terms of progress in the short time I’ve started my journey. The purchases are going to be drastically lower I’m afraid for a couple of months due to taxes and this new rental. I can’t wait to reach FI but I’m also having some fun on the way. It’s a tough balance sometimes between indulging in life’s pleasures now and using that extra income to invest for even more pleasures later. Dang due, absolutely crushing it! Amazing how fast your dividend income is growing. Of course, putting that kind of capital to work doesn’t hurt either! Looking forward to hearing future updates on the real estate. Certainly the commercial versus residential process is tremendously different, so hearing your experiences will be great. Thanks! Well, February won’t be the norm for a while since I’m using all available cash for a down payment and taxes coming up. I will have my work cut out for me to hit my goals afterwards. I know, I need to post about the commercial property. My time has been limited but I’ll get something up shortly. Commercial is a whole different animal for sure.